Has London Gone Bubble Tea Mad? London loves tea and with the growing variety of cultures in the population, it’s no surprise that there have been international influences on its tea consumption. It’s always good to try new things and what is life without variety? Don’t get me wrong, I love a traditional cup of tea, enjoyed over a relaxing afternoon usually with a scone or two. But if you, like London, are looking for something to liven up your tea drinking habits, bubble tea might be exactly what you’re after. This cold drink is said to have started in Taiwan in the early 1980s and was a twist on the already popular iced tea with syrup flavourings. A particular vendor took it a step further and added tapioca pearls, creating an unusual look and texture to the drink. These tapioca balls, which can be black, white, transparent and even rainbow coloured, coupled with the vast amount of flavours you can find added to your cup, make for a unique tea drinking experience. 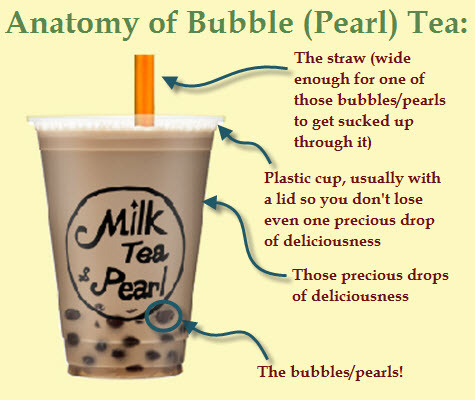 Served in a clear plastic cup, you even drink it with an extra large straw to slurp up the chewy tapioca pearls. Very different from the general idea of a cup of tea! The popularity of bubble tea in London, England, has certainly taken off with many independent establishments being setting-up across the city offering Londoners a taste of Taiwan. The novelty of this drink for me is that there is something for everyone, no matter your taste buds. But is it just that – a novelty? Die hard tea aficionados and purists might dismiss bubble tea as simply another tea fad and argue that it’s not actually tea because of the added flavourings and the Taiwanese tapioca paraphernalia. However, as more new tea houses are sprouting up around London every year, it proves that bubble tea is not just a fad, but here to stay in the English city. As always, you can do-it-yourself with bubble tea and you can find most of the ingredients relatively easily. Tapioca pearls can be bought from Asian stores or online and syrup flavourings or fresh fruit are available at most good supermarkets. For the tea base, there are many types you can use, but two of the more common kinds are red tea and jasmine green tea. If making this at home doesn’t appeal to you, but you’re interested in finding what all the fuss is about, I’m positive that you’ll find a bubble tea shop in any major city and by the sound of the growth in London, there’s probably one coming to a town near you. Matcha: The One Healthy Tea to Rule Them All?